Welcome to the website of the Southern Hampshire branch of CAMRA, the Campaign for Real Ale. If you'd like to know more about us and what we do, please visit our About Us page. If you'd like to receive our low-volume emails, then please join one of our Mailing Lists. The latest news of our activities locally and CAMRA's activities nationally are described below. Whatpub is Britain's best researched and most up-to-date pub guide. Go to Whatpub.com to find the pubs you need in Southern Hampshire or further afield. A warm Wednesday evening saw the crowds descend on The Steel Tank Alehouse in Central Precinct, Chandler's Ford, so many that there was queuing to get in - a case of 'one out, one in' for a while. The occasion was the presentation of Southern Hampshire CAMRA's Pub of the Year 2019 award to the Steel Tank Alehouse. 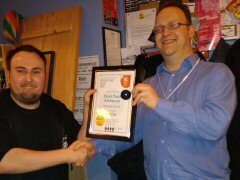 Pictured is publican Adam Beal (left) receiving the award from competition organiser Alex Presland. Congratulations to Adam for creating such a welcome establishment. The Steel Tank Alehouse now goes forward to the Wessex Regional Pub of the Year competition. We're delighted to announce our local branch's Pub of the Year 2019. This year's winner is The Steel Tank Alehouse in Central Precinct, Chandler's Ford. The finalist pubs were each visited by four volunteer judges, who assessed them against CAMRA's national Pub of the Year scoring criteria (which will also be used in the regional and national competitions). The four finalists, selected by CAMRA members before the judging, also included: The Guide Dog, Southampton (last year's winner); Steam Town Brew Co., Eastleigh and Witch's Brew, Southampton. A formal presentation of this award will be announced in due course. Online voting is now open, starting the process of selecting our Pub of the Year 2019. Vote for your favourite pubs. You can change your votes any time before 4pm on the 15th of January 2019. The four top pubs will then be surveyed to the same criteria used in subsequent rounds of CAMRA's national pub of the year competition. It's a great excuse to visit some great pubs and test out the beer before making your final selections. Previous local news can be found in our Local News Archive. Please send all spam to here so that we can feed it into our spam engine automatically!